As a historical document, this collection of two half-hour Ad Lib TV programs, dating from 1980 and ’82 and featuring the young Dianne Reeves, is a keeper. Out of the gate Reeves was fully formed, instantly captivating and in control of every nuance. Attired and coiffed elegantly but modestly, she barely moves a muscle when she sings, other than those controlling her eyes, which augment the lyrical content so expressively, and her lips, which emit a sound ever so stunning. Soulful and confident, Reeves appears somewhat tentative on the small studio stage at first, but she overcomes by projecting in a manner that is anything but. She already bears the strength and maturity of the older Reeves, although it’s apparent she is still feeling her way. During the first segment, in which Reeves is backed by pianist Billy Childs and his group A Fine Madness, the vocalist sails through a quartet of tunes highlighted by the ballad “Answer Me” and the Motown-ish “Welcome to My Love,” which gives her a chance to unloose a bit of grit. The band’s Reeves-less showcase “The Homes,” though, is little more than period lite-funk that mainly serves to interrupt the mood. The second show, the earlier of the two, is actually the more impressive. 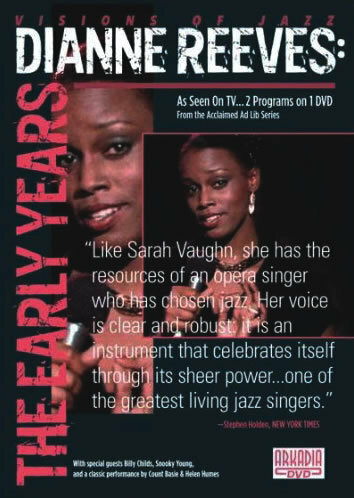 With Snooky Young on flugelhorn, Reeves tears into a boppish “Lady Be Good” that establishes immediately that, as the host, pianist/bandleader Phil Moore, states, Reeves was already “a new talent causing not only ripples but waves.” Her singing on the ballad “Everything Must Change,” and especially the show tune “On a Clear Day,” is virtually flawless. The latter, kicking off as a ballad, shifts into swing territory midway, Reeves unleashing her multi-octave bending, twisting and stretching effortlessly-her tasteful command of the now-dreaded melisma technique ought to be required listening for today’s would-be divas who think a note should never end. As a bonus, a vintage B&W clip of the Count Basie Band featuring Helen Humes, performing “I Cried for You,” is aired toward the end of the program. It’s a very cool clip, but when it gives way to Reeves’ show-closing “St. Louis Blues,” a tour-de-force performance featuring Young, it’s left in the dust. One minus: The audio quality of the DVD leaves something to be desired. The quieter passages and spoken sections are too often marred by audible hiss and electronic noise-any modern audio editing program could easily have fixed it, but fortunately it never threatens to dampen the enjoyment of the performances.